The internet is now an inevitable part of modern life. It is a basic service you can do without and it makes your life easier. Whether you want to get the best entertainment, make money, buy goods and services, compare the best schools or you have something else you wish to find, the internet has you covered. It is now possible to find everything you want under the sun within a few clicks and this makes the internet an invaluable service for every office and household. But how do you get the best internet service providers (ISP) in your area? Whether you plan to move to a new city or you want to switch your ISP, you don’t have to spend all your time doing research. 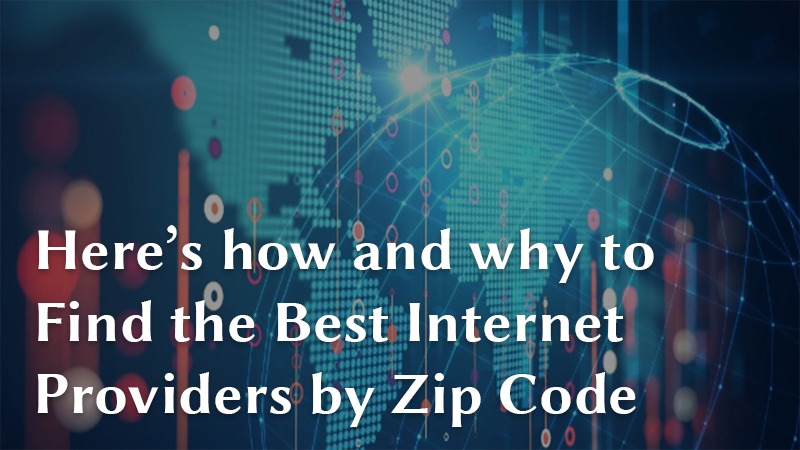 Finding the best internet providers by zip code in your area is now possible. This article highlights the benefits of using your Zip code to find available ISPs in your city and how to go about it. Keep reading. Why Look for ISPs in your Area? It is unfortunate that millions of consumers stick with exploitative internet services while more flexible packages are available. While only 4 to 5 large internet and cable companies existed a few years back, today you have a wide range of innovative companies offering faster, reliable and cheaper internet in every city. Gone are the days when you couldn’t contemplate switching to another ISP because of cancelation fees because today, there are no-contract internet packages available on the market. If your ISP today offers shoddy customer services, you don’t have to suffer in silence. It is easy to make the switch and it all starts with a simple search for available alternatives in your area using a zip code. This is truly a digital era where the freedom of choice is a few clicks away and for this reason, you should always look out for better internet deals. There are now online platforms that allow you to search for available internet providers using your zip code alone. Internet speeds offered by ISPs in your area. Useful resources such as how to choose the best internet provider, benefits of bundling services, advantages of no-contract internet packages and so much more. You don’t have to spend hours looking through brochures with cooked up data. Today, you only have to visit a reliable search by zip platform to find internet companies near you. Many consumers have fallen for marketing gimmicks when moving into new area codes only to discover the ISPs are not available nationwide. You might have been using dial-up internet for the longest time but did you know you can switch to cheaper and faster internet in your area? Yes, many people stick to their old service providers and for internet services, you have other options including Cable broadband and Fiber optic service (FiOS). These internet packages come with extras such as TV and phone services. With the traditional internet packages, you had to stick with the service provider through a lock-in contract. Today, you can search for a no-contract ISP in your area with a quick zip search. Fiber optic service (FiOS) and cable internet services are faster, cheaper and more reliable. Most household owners are yet to take advantage of these services, yet they are available in their neighborhoods. A search by zip code for internet services gives you a chance to save money and enjoy better services. Like any other consumer, the internet is your first source of information. When searching for an ISP in your area, you will also get invaluable tips from the search platform to help you make an informed choice. The best ISPs search platforms such as Cable Papa introduce you to the biggest brands in the market including Xfinity By Comcast, Cox, Earthlink, Qwest Centurylink, Optimum Online, Frontier, Centurylink, Mediacom, Cable One and Spectrum among others. You can now get insightful information on these services including objective reviews and testimonials from consumers. Thishelps you make an informed choice. Searching for the best internet service providers used to be a daunting task but things have changed. With the search for internet providers by zip code, it is now possible to find cheaper and reliable internet services. A good ISPs search platform will give you extensive information to help make the right choice. Through a link to the specific ISP, it is possible to evaluate their services and determine the best package for your home or office. Searching by Zip code also saves you time that would have gone to personal research and you also make a more confident decision based on independent reviews. If you have been experiencing downtime, slow speeds, poor customer support with your ISP, it is time to seek an alternative. It will only take a few clicks to find a better internet service provider and you won’t have to leave your seat.